The super thing about this dish is that you get full flavour with little effort. Brown meat in large skillet on medium-high heat. Add onions; cook 3 to 5 min. or until softened, stirring occasionally. Drain. Return meat mixture to skillet. Add pasta sauce and chili sauce to meat mixture; stir. Bring to boil, stirring occasionally. Simmer, partially covered, on medium-low heat 30 min., stirring occasionally. About 15 min. before meat sauce is done, cook spaghetti as directed on package, omitting salt. Drain spaghetti. 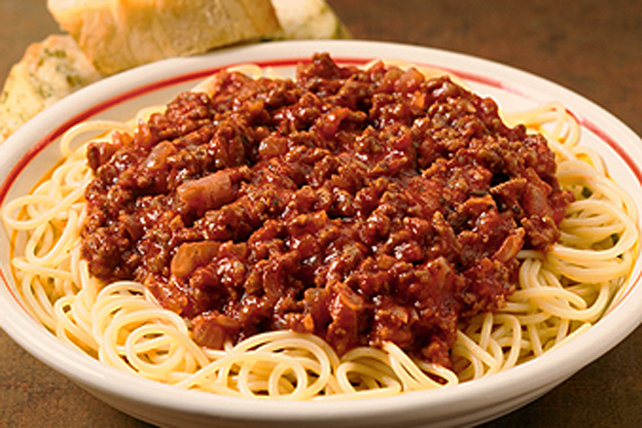 Serve topped with meat sauce. Sprinkle with Kraft 100% Parmesan Light Grated Cheese before serving.